1777 Patrick Brontë is born “Patrick Brunty” in County Down, Ireland. 1806 Patrick earns a bachelor’s degree in theology from Cambridge. 1807 Patrick is ordained by the Church of England. 1812 Patrick marries Maria Branwell and moves to Yorkshire. 1814 Maria Brontë is born. 1815 Elizabeth Brontë is born. 1815 Patrick Brontë is named curate at Thornton. 1816 Charlotte Brontë is born. 1817 Patrick Branwell Brontë is born. 1818 Emily Jane Brontë is born. 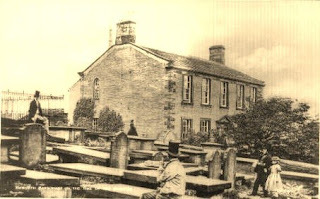 1821 Maria Brontë (wife of Patrick) dies. Lancaster; Charlotte and Emily soon follow. Charlotte and Emily return home. 1831-32 Charlotte attends Roe Head School in Mirfield. returns home shortly after. Anne takes Emily’s place at Roe Head. 1838 Emily is hired to teach at Law Hill School. She returns home six months later. 1838 Branwell goes to Bradford to become a portrait painter. becomes governess to the Robinson family. 1840 Branwell takes a position as assistant clerk in Sowerby Bridge Railway Station. 1842 Charlotte and Emily travel to Brussels to study at the Pensionnat Heger. 1844 Charlotte returns to England. dismissed for having an affair with Mrs. Robinson. 1846 Publication of Poems by Currer, Ellis, and Acton Bell. 1847 Charlotte's Jane Eyre published. 1847 Anne's Agnes Grey and Emily's Wuthering Heights published together. followed three months later by Emily. 1849 Anne dies of tuberculosis. 1849 Charlotte's Shirley is published. 1853 Charlotte's Villette is published. 1854 Charlotte marries Arthur Bell Nicholls. 1855 Charlotte dies of tuberculosis and complications from pregnancy. 1857 Charlotte's The Professor is published. 1861 Rev. Patrick Brontë dies, having outlived his entire family.